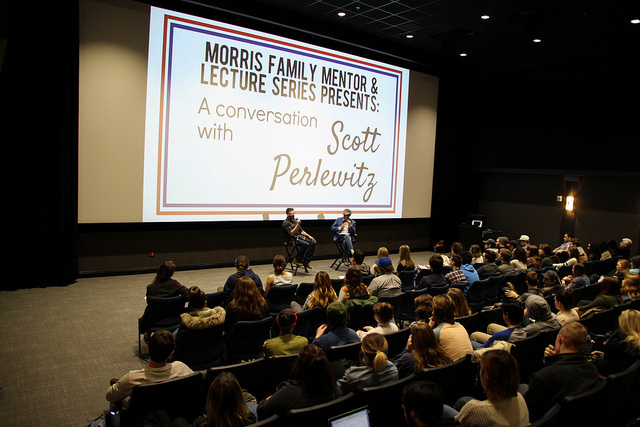 Belmont hosted its second annual Morris Family Mentor and Lecture Series on Friday, Feb. 26. This series, sponsored by the Morris Family, honors industry professionals by bringing them to campus to inspire others through their work in the entertainment and music industry. This year’s speaker was Scott Perlewitz, minister of propaganda for Sub Pop Records. Students filled the Johnson Large Theater to listen to the question and answer session led by Belmont Music Business Professor Dan Keen. The seminar started with Perlewitz briefly describing Sub Pop Records. The Seattle based independent record label was founded in 1988 and was often associated with the grunge movement. Some of the label’s early releases came from artists like Nirvana, Mudhoney, Soundgarden and TAD. In later years, the label released records from artists including The Shins, Iron and Wine, Band of Horses and Flight of the Conchords. Sub Pop now works with Father John Misty, Fleet Foxes and The Head and The Heart. Perlewitz said he grew up loving music, but since he grew up in a small town outside of Green Bay, Wisconsin, his industry exposure was limited. He went to University of Wisconsin to pursue a pre-medicine degree, but ended up switching to a Bachelor of Fine Arts. “I knew I wasn’t going to be a doctor, and I knew I wasn’t going to be a painter, so I thought I could be a lawyer,” said Perlewitz. Perlewitz went on to get his Masters in Communication Management and Communication Law from The University of Southern California. Perlewitz happened to find his way into the music industry as an intern for MTV, leading him to jobs in marketing and promotions at Virgin Records, Geffen Records and Warner Records, before landing his job at SUB POP in 2011.